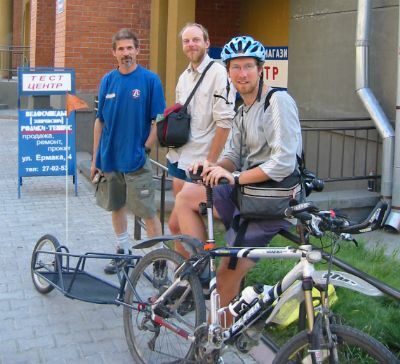 Our friends at the cycling club took us out to see the sights of Novosibirsk. 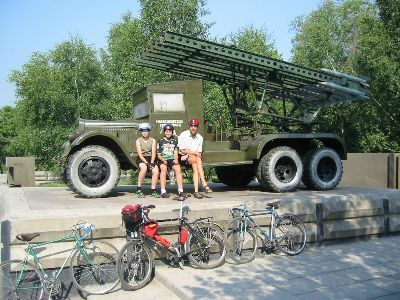 This is a "Katuska" rocket launcher used in the Second World War. It may look like a 1930's delivery van with some Mecano bolted to it, but was apparently a very effective weapon. 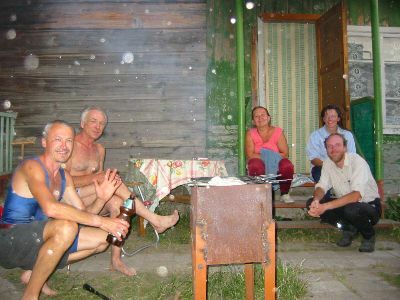 At the weekend Venamin took us to his dacha in the outskirts of the city. 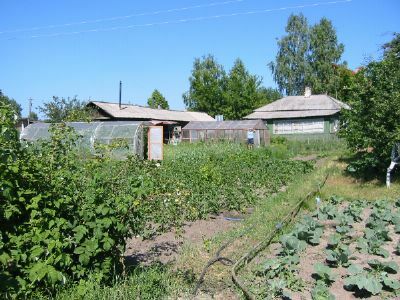 Here he and wife grew vegetables and relaxed at the weekend. Nearby was a sunny beach on the Ob River - perhaps not what you might expect in the middle of Siberia. Watching the river flowing smoothly past we fantasized about a future journey "By Lilo to the Arctic Circle" !! And in the evening we had grilled chicken. Not so different to a British barbeque, except of course the drinks were vodka! On the 9th July we finally got our hands on our parcel of bike spares. It had been in Russian customs for over a week and we had to pay duty on it amounting to about 40% of its value. But it was worth it for two pairs of Schwalbe Marathon tyres. Strong, hardwearing and with deep tread they will hopefully be just the thing for Altai and Mongolia. We also got new chains and fell foul of the old problem that a new chain doesn't always run on an old block. I rushed into town in the evening to Test Centre (above) and got a new 9 speed cassette and new rings for my chainset. Ju's seems to be OK.